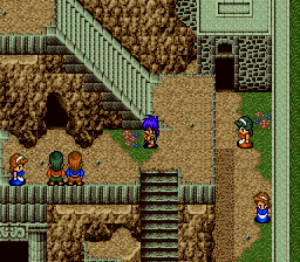 The game takes place many years after Last Bible II. People are living in relative harmony with the beasts. In the intro, a war hero named Alek Messena reaches the gates of the underworld. Before he collapses, he says that he hopes that his old friend (Glen Larsford) will survive. 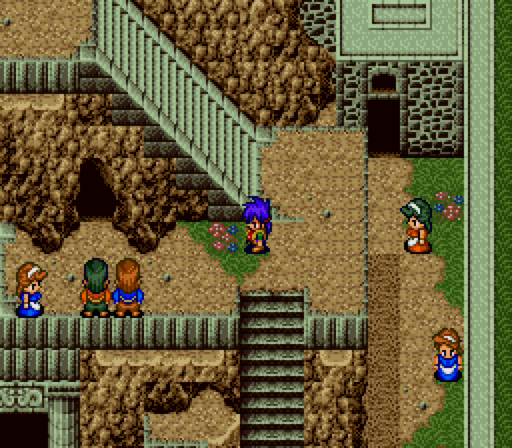 The player begins the game as Glen’s son Ciel. Ciel lives a rather peaceful life, playing with his friends and brother, and going to school to learn how to make use of his potent gaia (a supernatural form of energy). Occassionally, people mention a devastating war, known as the Polisian War, that came to an end about fifteen years ago. Ciel discovers that the formerly warring (and now united) Polisian States are working to spread with their gaia prohibition law and end the threat of war once and for all. Some of Ciel’s classmates live in the Polisian States, which make use of Phelesteau, a perpetual engine that provides free energy for everyone in the city, under one condition – that they never release their gaia within the city limits (or be thrown in prison). After his village is attacked by soldiers who came to kill his father, Ciel is forced to uncover the mystery of what happened between Glen and Alek’s old team, the Phelesteau engine, and the Polisian States. This custom game is built with the highest quality parts and is tested for quality performance. We have a wide variety of colors available for the picking, or you may wish to have the classic gray. Comments, questions? Send ’em in! We would love to hear from you!